In some poker variants, particularly non-flop games, like Razz and Stud, a bring in is a mandatory bet. Other forced bets include antes, big blinds and small blinds. Antes are paid by every player every round, and blinds are based on position. The two players to the left of the dealer button pay the big and small blind, respectively. The main difference between a bring in and those forced bets is that the bring is based on card values or other factors, and therefore, it is possible for a single player to pay the bring in multiple hands in a row. In Razz, the player with the highest-ranked face-up card pays the bring-in bet. In Stud, the player with the lowest-ranked face-up card pays the bring-in bet. Like antes and blinds, the point of the bring-in bet is to ensure an opener, or first wager. Without such actions, there would be many null hand, so this approach greases the wheels, and avoids much of that dead time. Bring ins are usually used in games with antes as opposed to structured blinds. 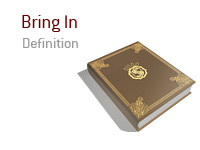 A distinction between brings ins and blinds is that the bring-in counts toward bet completion. For instance, if a game has a $5 fixed bet and $2 bring-in bet, the second bet could be a call for $2 or a raise to $5. If any player raises to $5, the player who paid the bring-in bet only need add an additional $3 to call. If the bet were raised to $10, then the player who paid the bring-in would have to pay the entire additional $5 to stay in the game. Federal Grand Jury Investigating Full Tilt Poker?